You've found the “U.S. Mallard Duck Breeders” page here at Hobby Farm Wisdom! If this is the first time you have visited our site: Welcome! Also called the Wild Duck, Mallards are dabbling ducks and they breed throughout temperate and subtropical areas of America, Europe, Asia, and North Africa. They are considered the most familiar breed of Duck in the USA and can commonly be found in ponds, parks, wild wetlands and estuaries. Mallards are large sized birds with a horizontal stance and wide flat beaks. Males have a dark iridescent green head that ends in a white stripe around the neck and a bright yellow bill. Their body is grey with a brown breast and black rear. Females are mottled brown with orange and brown bills. Both genders have a blue speculum patch in their wings. 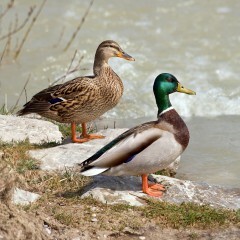 The Mallard is a migratory birds and usually stay grouped with other birds. They are fairly tame and will live in any wetland habitat whether natural or artificial. This breed is largely hunted and is considered the ancestor to most domestic breeds.